Antioxidants are a broad group of compounds that destroy free radicals, in the body, thereby protecting against oxidative damage to cells. Free radicals are molecules with at least one unpaired electron. As a consequence, they are highly unstable and reactive, always cruising around aggressively looking for other compounds from which they can steal electrons such as DNA, fats and protein, in an effort to become stabilized. Antioxidants also work synergistically with each other. Vitamin C, for example, recycles vitamin E that has been used up, selenium works in concert with vitamin E, zinc is needed to maintain normal blood concentrations of vitamin E, and therefore a combination of antioxidants gives you the most mileage of any antioxidant intake. 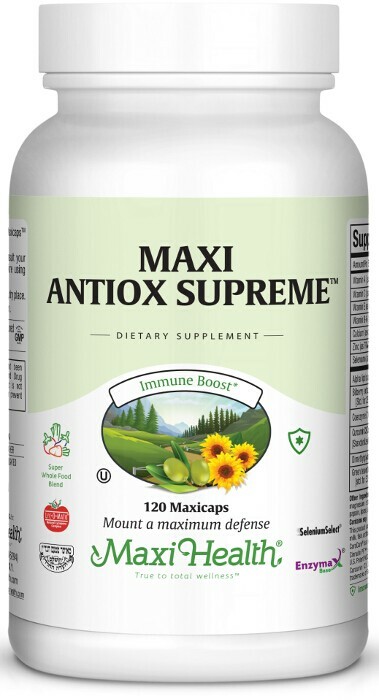 Maxi AntioX Supreme is unique in that it contains 22 of the finest, most potent antioxidants giving you the maximum benefits. Try it and feel the difference! Take two (2) Maxicaps™ daily or as directed. Other Ingredients: Rice flour, vegetable cellulose, magnesium stearate, Enzymax® (calcium carbonate, bromelain, papain, lipase, amylase, protease, silica), sugar ester, decaglycerol monooleate. This product contains no animal products, wheat, gluten, salt, yeast, milk, fish, artificial flavors or colorings. Biolut™ is a trademark of Biolut SA de CV; CaroCare® is a registered trademark of DSM Food Specialties; Cinnulin PF™ is a trademark of Integrity Nutraceuticals International; Enzymax®, a vital digestive enzyme complex, is a registered trademark of Maxi Health Research® LLC. ; Lyc-O-Mato® is a trademark of LycoRed Natural Products Industries Ltd.; Pomegranate 40p™ is a trademark of PL Thomas & Co., Inc.; NewGar® is a registered trademark of Nature*4*Science, Inc.; Pycnogenol® is a registered trademark of Horphag Research Ltd.; Selenium SeLECT® is a registered trademark of Sabinsa Corp.; Suntheanine® is a registered trademark of Taiyo International Inc.; TRAACS® is a registered trademark of Albion Laboratories, Inc.